* Diameter estimates based on the object's absolute magnitude . Asteroid 2012 DA14 February 15 2013 impact? The meteors were serenaded by nightingales. "The birds arrived here about a week ago and they were constantly singing , which made the observation even more memorable!" she adds. "Imagine being out at night, surrounded by nightingales, with a bright Milky Way and meteors falling through our atmosphere - a wonderful celebration of Earth Day in 2012 which coincided with the Lyrid maximum!" Event into space in USA on Sunday, 22 April, 2012 at 17:58 (05:58 PM) UTC. 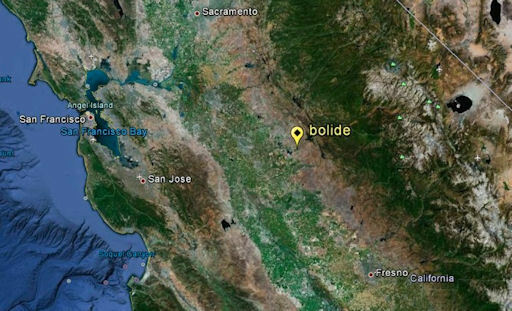 People in Northern California and Nevada reported hearing a loud boom in the sky above the Sierra Sunday morning. The Tuolumne County sheriff's department said they are investigating the possibility that it might have been the physical impact of an overnight meteor shower. Some people in the Tahoe area said they saw what they believed to be a meteor just prior to the sound. People who live in in Lake Tahoe, El Dorado County, Placer County, Tuolumne County, Amador County and Nevada County contacted our sister station in Sacramento. KCRA is reporting that they heard the sound just after 8:30 a.m. A television station in Reno said they received similar calls from the city of Reno and as far away as Incline Village. Meteorologists in California and Nevada including our own Rob Mayeda said there were meteor showers Saturday night that could have still been going on Sunday morning. If the boom was a signal that an outer space rock made it way through the atmosphere, then there could be a rock or rocks now on Terra Firma. So far, no one has called authorities or television stations to report "a hit." A loud explosion heard across much of Nevada and California on Sunday morning rattled homes and prompted a flood of calls to law enforcement agencies on both sides of the Sierra Nevada, some reporting fireball sightings. The sound and the light show were likely caused by a meteor that entered Earth's atmosphere, astronomers said. "It made the shades in my room shake hard enough to slam into the window a couple times," said Nicole Carlsen of the Reno area. "I kept looking for earthquake information, but (there was) nothing. I even checked the front of my house to make sure no one ran into the garage. I wish I had seen the meteor." Erin Girard-Hudson of Arnold, Calif., told The Union Democrat of Sonora, Calif., that the loud boom that occurred around 8 a.m. made her 2-year-old daughter, Elsie, cry. "It knocked me off my feet and was shaking the house," she said. "It sounded like it was next door." No damages or injuries were immediately reported. There were no reports of earthquakes at the time. Some people reported seeing a brilliant light streak across the sky at the same time. Sightings occurred over roughly a 600-mile line across the two states, including Reno, Elko and North Las Vegas in Nevada, and the San Francisco, Sacramento and Bakersfield areas in California. Astronomers said they believe the mysterious light was a fireball, which is a very bright meteor. It will take time to determine the path of the fireball and where it broke up, they added. "From the reports, I have no doubt it was a fireball," said Robert Lunsford of the Geneseo, N.Y.-based American Meteor Society. "It happens all the time, but most are in daytime and are missed. This one was extraordinarily bright in the daylight." Lunsford said it's "pretty rare" for fireballs to produce a loud explosion. For that to happen, he explained, the meteor must have survived intact until breaking up about five miles above Earth. Most fireballs are visible at 50 miles above Earth. "If you hear a sonic boom or loud explosion, that's a good indication that some fragments may have reached the ground," Lunsford told The Associated Press. "We'll have to get some people to work on it to pinpoint where it broke up and see if anything can be found on the ground." Lunsford said more than 20 people in the two states had filed reports with his group by midmorning about seeing the fireball. "I have been looking at the sky for 30 years, and I have never witnessed something so amazing and puzzling. It is an event that makes you glad to be alive," said Matthew Neal of San Francisco. "The main body was bright green and the head was bright red and white." Greg Giroux of June Lake, Calif., located along the eastern Sierra just west of Yosemite National Park, also was impressed. "This was by far the brightest fireball/shooting star I've ever seen, especially since it was in full sunlight," he said. "After the flash, it broke up into pieces, then I lost sight of it as it went behind a mountain." In Nevada, the light show was seen as far east as Elko, about 300 miles east of Reno, and as far south as the Las Vegas area. Marcia Standifer of Spring Creek, near Elko, and her husband were out drinking coffee when they saw the fireball at the same time. "It was a very bright ball of white light, then dimmer to the horizon," she said. "We thought this was very unusual due to the bright daylight and how vivid the object was." Tracey Cordaro of North Las Vegas said the sighting "took my breath away." "It was amazing," she said. "It looked as if it was disintegrating rapidly, but was still quite large when it disappeared from my view ... (It was) bright green, visible in the bright sunlight." A fiery meteor created a thundering explosion and traced a rare daylight fireball seen for about 600 miles across Nevada and California on Sunday, before apparently breaking up harmlessly at high altitude, astronomers said. NASA researchers at the Jet Propulsion Laboratory said the midair explosion, centered over California's Central Valley east of the San Francisco Bay area, was the equivalent of the detonation of about 3.8 kilotons of TNT—about one quarter the energy released by the atomic bomb dropped on Hiroshima, Japan, in 1945. "The meteor was probably about the size of an SUV," said Donald Yeomans, manager of NASA's Near-Earth Object Program Office at the laboratory, in Pasadena, Calif. "This was a big one. An event of this size might happen about once a year, but most of them occur over the ocean or an uninhabited area." There were no reports Monday that any fragments of the object had reached the ground or caused any damage. No major telescope in the region tracked the early-morning fireball. NASA astronomers said the explosion might have been five to 10 miles high, which was high enough to let the sound spread widely. SIERRA FIREBALL DECODED: On Sunday morning, April 22nd, just as the Lyrid meteor shower was dying down, a spectacular fireball exploded over California's Sierra Nevada mountain range. The loud explosion rattled homes from central California to Reno, Nevada, and beyond. According to Bill Cooke, head of NASA's Meteoroid Envronment Office, the source of the blast was a meteoroid about the size of a minivan. "Elizabeth Silber at Western University has searched for infrasound signals from the explosion," says Cooke. "Infrasound is very low frequency sound which can travel great distances. There were strong signals at 2 stations, enabling a triangulation of the energy source at 37.6N, 120.5W. This is marked by a yellow flag in the map below." "The energy is estimated at a whopping 3.8 kilotons of TNT (about one fourth the energy of the 'Little Boy' bomb dropped on Hiroshima), so this was a big event," he continues. "I am not saying there was a 3.8 kiloton explosion on the ground in California. I am saying that the meteor possessed this amount of energy before it broke apart in the atmosphere. [The map] shows the location of the atmospheric breakup, not impact with the ground." "The fact that sonic booms were heard indicates that this meteor penetrated very low in atmosphere, which implies a speed less than 15 km/s (33,500 mph). Assuming this value for the speed, I get a mass for the meteor of around 70 metric tons. Hazarding a further guess at the density of 3 grams per cubic centimeter (solid rock), I calculate a size of about 3-4 meters, or about the size of a minivan." "This meteor was probably not a Lyrid; without a trajectory, I cannot rule out a Lyrid origin, but I think it likely that it was a background or sporadic meteor." News and eyewitness reports: #1 , #2 , #3 . This weekend, NASA scientists, amateur astronomers, and an astronaut on board the International Space Station will attempt the first-ever 3D photography of meteors from Earth and space. "The annual Lyrid meteor shower peaks on April 21-22," says Bill Cooke, the head of NASA's Meteoroid Environment Office. "We’re going to try to photograph some of these 'shooting stars' simultaneously from ground stations, from a research balloon in the stratosphere, and from the space station." Lyrid meteors come from Comet Thatcher. Every year in late April Earth passes through a stream of debris from the old comet, which has been bringing Lyrid meteors to our planet for at least 2600 years. Specks of Thatcher’s dust hit the top of atmosphere at 110,000 mph and disintegrate in a flurry of meteors. Most years, the shower produces about 15 to 20 Lyrids per hour. This is a good year to look for Lyrids because the Moon will be new when the shower peaks. Dark skies favor sightings both from Earth and from Earth orbit. "Even though the Lyrids are not noted for spectacular rates, the combination of a New Moon and a very favorable viewing geometry from the International Space Station (ISS) presents a unique opportunity to simultaneously image shower meteors from above and below," says Cooke. ISS Flight Engineer Don Pettit will be operating the camera on the space station. "Even though his equipment was designed for tasks other than meteor observing, Don is a skilled astrophotographer, and we have every confidence that he will maximize the chances of capturing a Lyrid from 400 km above Earth's surface." As the Space Station passes over North America multiple times on the night of April 21st, a network of all-sky cameras--some operated by amateur astronomers and others by NASA--will be recording the shower. In Bishop, California, a group of high school and middle school students will launch a helium balloon to the stratosphere. The payload floating some 40 km above Earth’s surface will carry an experimental low-cost meteor camera and recorder developed by the Meteoroid Environment Office. As astrophotographers know, catching a fleet meteor with a single camera takes some luck. Catching one meteor with multiple cameras, some of them on platforms moving as fast as 17,000 mph, scattered from Earth to Earth orbit, sounds more like winning the lottery. "Actually, we think the odds are fairly good,” says Cooke, who estimates a 1 in 6 chance of a simultaneous catch between the ISS and one of the wide-field ground cameras. If the effort does produce 3D imagery of any Lyrids, Cooke plans to use the photos to test ideas and algorithms for processing date gathered by future space-based meteor observatories. “We’re laying the groundwork for small satellites that might one day be used to monitor meteor showers from Earth orbit,” he explains. Cooke encourages sky watchers everywhere be alert for meteors this Saturday night. Typical Lyrids are about as bright as the stars of the Big Dipper, so they’re good for beginners. And it's not unusual to see one or two fireballs when the shower peaks. A good time to look is during the hours after midnight, when the shower’s radiant is rising toward its zenith. 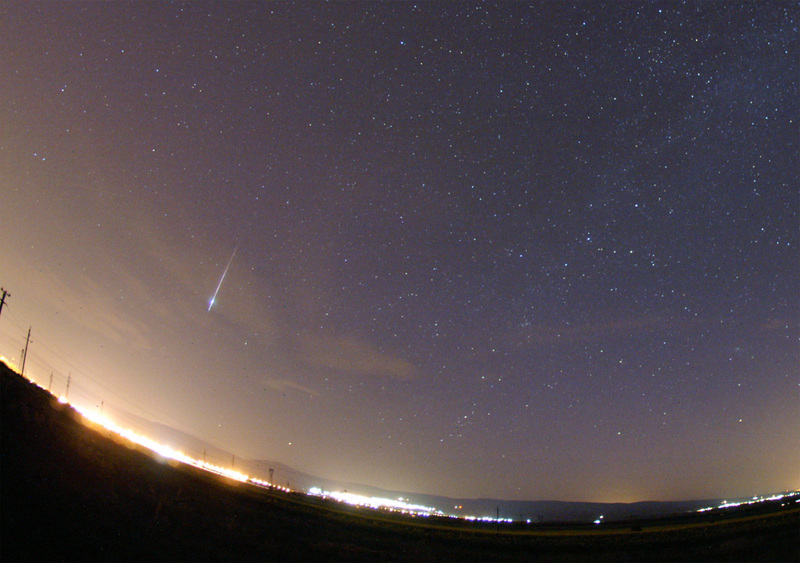 Although the Lyrid meteor rate is usually capped at 20 per hour, better displays sometimes occur when Earth glides through an unusually dense clump of debris. In 1982, for instance, astronomers counted as many as 90 Lyrids per hour. "Such an outburst would be great for our experiment," says Cooke. Amateur astronomers who wish to help monitor the 2012 Lyrids are encouraged to download the Meteor Counter for iPhones http://science.nasa.gov/science-news/science-at-nasa/2011/13dec_meteorcounter/. The app records meteor counts and reports the data to NASA for possible analysis. Earth Has Scores of Mini-Moons, Models Predict About a thousand unseen objects are in orbit at any time, study says. Our moon is not alone: Scores of unseen mini-moons are now in orbit around Earth , new computer models predict. What's more, these tiny moons occasionally plummet through our planet's atmosphere, creating brilliant fireballs, the researchers say. The findings are based on supercomputer simulations of ten million asteroids known to fly through the Earth-moon system. The models show that objects that circle the sun in orbits similar to Earth's are likely to be captured as mini-moons. "We accurately tracked their motion—including the gravitational tugs from the sun and all the other planets and big asteroids in the solar system—and found that 18,000 of [these asteroids] were captured and briefly went into orbit around the Earth," said study co-author Robert Jedicke , an astronomer at the University of Hawaii. "We estimate that there are one or two washing machine-size mini-moons and about a thousand larger than a softball [orbiting Earth] at any time," he said. The captured moons would orbit Earth in twisted, convoluted paths. In fact, the simulations show that most mini-moons hang around for less than a year before they're either spit back out to orbit the sun or end up on a collision course with Earth, Jedicke said. "The moon perturbs the orbit of about one in a thousand, so they hit the Earth—some of the meteors that you see at night are actually mini-moons falling to Earth." In addition to small space rocks, the models predict that once in awhile Earth captures something even larger. The team's estimates show that every half century an object the size of a large dump truck—about 33 feet (10 meters) across—joins our roughly 2,100-mile-wide (3,400-kilometer-wide) moon. And even larger objects—each the size of a football field, or about 328 feet (100 meters) across—can be captured by Earth's gravity every hundred thousand years. At that size, Jedicke speculates, the extra moons might even be visible to the naked eye. "A hundred thousand years is about the time frame that human beings have been doing things like leaving their handprints on cave walls, so maybe in that time frame somebody once actually looked into the sky and saw a mini-moon moving across the sky," he added. Jedicke and his team are the first to make predictions about mini-moon sizes and distribution, and it appears their predictions are fairly accurate. The only known mini-moon was a 9.8-foot-wide (3-meter-wide) asteroid dubbed 2006 RH120, which orbited Earth less than a year before resuming its previous life orbiting the sun. "The size and orbital properties of 2006 RH120 are perfectly consistent with our models," Jedicke said. "Had we done our study ten years ago, we could have predicted that an object like 2006 RH120 would be detected soon." Even with the new simulations, the researchers caution that actually seeing more mini-moons will be challenging, because the objects are relatively small and thus faint. In addition, the gravitational effects that draw in Earth's extra moons tend to set them whipping around the planet at high speeds, making them even harder to pinpoint. "We are currently trying to figure out how to use astronomical surveys to spot them regularly," Jedicke said. For instance, "the largest ones could be detectable by the advanced amateur astronomer with a 50-centimeter-diameter [20-inch-diameter] telescope," he said. "But discovering new mini-moons will require an asteroid survey that covers much of the sky in a single night and detects objects that are very faint." The study of Earth's mini-moons was published in March in the journal Icarus . "On the eve of Earth Hour, whilst most of Australia was asleep, I was alone in my back garden, searching for the ghostly trail of 2012 EG5," says Simmons. "Alone but not lonely, my Celestron C9.25 and Tak EM200 mount were purring along, tracking 2012 EG5 as it flitted through the camera field only a few hours before its closest encounter. As the clock ticked over into 1st April, the estimated magnitude was approx 14.4 as it fast approached the Earth. This is to be no April's Fool hoax – it's for real!" Comet SWAN is a Kreutz sungrazer , a fragment of the same ancient comet that produced sungrazing Comet Lovejoy in Dec. 2011. Comet Lovejoy famously survived its brush with the sun and put on a flamboyant show after it emerged from the solar fires. While Comet SWAN is cut from the same cloth, it appears to be a smaller fragment, and thus less likely to emerge intact. Much depends on the comet's orbit. "We still don't know how close Comet SWAN will come to the stellar surface," says comet expert Karl Battams of the Naval Research Lab in Washington DC. "I don't think this comet will make it. We have seen Kreutz comets almost as big as this one that have certainly not [survived]. So the odds are stacked against it." Stay tuned to Karl Battam's blog for updates. Couldn't find it? Here's a finder chart . This is a Kreutz sungrazer, a fragment of the same ancient comet that produced sungrazing Comet Lovejoy in Dec. 2011. 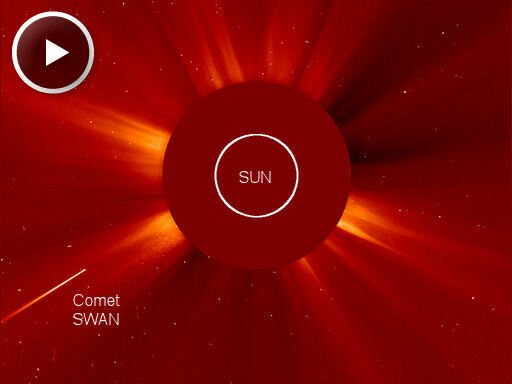 According to comet expert Karl Battams of the Naval Research Lab in Washington DC, "Comet SWAN is one of the brightest Kreutz-group comets ever observed by SOHO, although not quite as bright as Comet Lovejoy." Battams forecasts a peak magnitude of -1 for Comet SWAN, while Lovejoy was three magnitudes brighter at -4. Will Comet SWAN survive its plunge through the sun's atmosphere as Comet Lovejoy did ? Probably not, but experts also said Comet Lovejoy would not survive, and they were happily wrong . Stay tuned to Karl Battam's blog for updates. Event into space in Norway on Monday, 12 March, 2012 at 12:05 (12:05 PM) UTC - An extremely rare meteorite fell through the roof of a cottage house, situated in an allotment in Rodelokka center of Oslo. According to Norwegian daily VG, the meteorite caused a hole in the roof of the house. The owner of the house, Rune Thomassen told VG that the meteorite piece was about as big as a snowball, and as heavy as a regular stone in its size. Expert on astrobiologi and geophysicist Hans Amundsen believes that it is a very rare meteorite because it contains fragments of many different rocks that are cemented together, a so-called breccia. It is relatively unusual to find pieces of meteorite hitting earth. Norway has recorded fourteen such findings since 1848.The last time was in Moss in 2006. Four asteroids are reported inside ten lunar distances (LD) of Earth today. Risk-listed radar target 2012 DW60 enters Earth's Hill sphere and, within the Hill sphere, radar target 2012 DH54 comes its closest this time around, reaching 3.32 LD at 0903 UTC. Further out, 2012 EA is headed from 7.98 to 9.06 LD and 2012 EM1 from 8.89 to 9.71 LD. Approaching our neighborhood next, 2007 HV4 arrives inside ten LD on April 14th. Event into space in United Kingdom on Sunday, 04 March, 2012 at 05:09 (05:09 AM) UTC. - Reports of a "bright light" and an "orange glow" were received by police across Scotland and the north of England around 9.40pm. The Met Office tweeted: "Hi All, for anyone seeing something in the night sky, we believe it was a meteorite." A spokesman for Strathclyde Police said the force had been "inundated" with calls about a bright object in the sky across the west of Scotland. A Durham Police spokeswoman said a number of calls came in around 9.45pm from concerned members of public who had seen a "bright light or a fire in the sky" and believed it may have been incidents involving an aircraft. "It has been confirmed with air traffic control that there are no incidents of aircraft in difficult and nothing registered on radar," she said. "The sightings are believed to be either an asteroid burning out or similar which has been restricted to the upper atmosphere only." Grampian Police said reports of people seeing a "flare or a bright object with a tail" were received from across the region. And Dumfries and Galloway Constabulary said numerous calls were made about a "large ball of fire in the sky" across Annandale and Eskdale. One user wrote on the force's Facebook page: "It was awesome to see! Really big and bright!" Hundreds of people took to Twitter to report similar sightings across Scotland and the north of England. People described seeing a bright fireball moving across the sky with a large tail. The Kielder Observatory also reported the sighting of a "huge fireball" travelling from north to south over Northumberland at 9.41pm. The Observatory posted on Twitter: "Of 30 years observing the sky #fireball best thing I have ever seen period." Large fireball captured with my meteor cam 3rd March 2012 9.40, camera is south east facing. Location is the North East of England. Event into space in Canada on Wednesday, 22 February, 2012 at 12:44 (12:44 PM) UTC. Radar observations of (162421) 2000 ET70, a Near Earth Asteroid with an Aten type orbit which makes an earth close approach on 2012-Feb-19 at ~ 0.045 AU. Due to its size and orbit it is classified as a PHA or Potentially Hazardous Asteroid. The full-sized image shows the comet's fan-shaped dust tail, which roughly traces the comet's orbit, and its pencil-thin gas tail, which points almost directly away from the sun due to the action of the solar wind. Although the comet is now receding from the cluster, observers with wide-field telescopes can frame the pair in a single exposure for several mornings to come. They are located in the constellation Hercules, high overhead in northern hemisphere skies before sunrise. Sky and Telescope offers a sky map of the comet's path. Observers with computerized GOTO telescopes can track the comet by plugging in orbital elements from the Minor Planet Center. The ten minute exposure shows the comet's fan-shaped dust tail, which roughly traces the comet's orbit, and its pencil-thin gas tail, which points almost directly away from the sun due to the action of the solar wind. The star cluster and the comet are both located in the constellation Hercules, high overhead in northern hemisphere skies before sunrise. Sky and Telescope offers a sky map of the comet's path. Observers with computerized GOTO telescopes can track the comet by plugging in orbital elements from the Minor Planet Center. 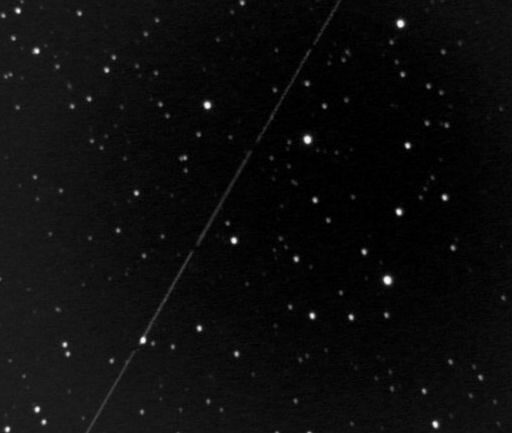 ASTEROID FLYBY: Newly-discovered asteroid 2012 BX34 will fly past Earth today Jan. 27th only 77,000 km (0.2 lunar distances) away. There is no danger of a collision with the 14-meter wide space rock. Advanced amateur astronomers might be able to observe the flyby as the asteroid brightens to 14th magnitude just before closest approach on Friday at 1530 UT. MOSCOW, January 27 - RIA Novosti. Asteroid 2012 BX34 size of a three-story building flew in Friday night at a minimum distance of fifty years from Earth - about 60 thousand kilometers, the next time he gets close to the planet in October 2013, but the fly is much more on - 54 million kilometers. The object was discovered on Wednesday, January 25, members of the American review, "Catalina" (Catalina Sky Survey), whose main task is to find small solar system bodies - asteroids and comets. Later these results were confirmed by observatories "Mount Lemon" (Mt. Lemmon) and "Magdalena Ridge" (Magdalena Ridge). He was included in the group of celestial bodies, from time to time may be closer to Earth (Near Earth Object - NEO), but did not enter the number of potentially dangerous (Potentially Hazardous Asteroids - PHA), which do not exclude the possibility of a collision with our planet. On Friday, at 19.25 Moscow time, he broke with the Earth at a distance of 0.00043 astronomical units, or 65.4 thousand kilometers - at 30,000 kilometers above the geostationary orbit. Before the convergence of American astronomers had radar asteroid with the Goldstone radar in California's Mojave Desert. "The asteroid is so small that we could barely detect it, although we scanned it with a resolution of 3.75 meters," - said the scientists who conducted the radar, on a dedicated forum MPML. Earlier estimates of the size asteroid were in the range of 8 to 18 meters, possibly after his radar parameters to be determined. Scientists assure us that no threat to Earth asteroids of this size are not - even if such an object would have entered the Earth's atmosphere, it will likely not have reached the planet's surface is completely burned in the atmosphere. According to scientists, about once a year in the Earth's atmosphere invades an asteroid with a diameter of several meters. However, they are burned in the atmosphere, causing an outbreak at an altitude of 30-40 kilometers, and do not cause any harm. Morning, January 28, about 04.44 Moscow time, the asteroid will fly to 293.2 thousand kilometers from the moon, and April 25 razminetsya with Mercury at a distance of 10.4 million kilometers. The next time an asteroid in 2012 BX34 closer to Earth October 8, 2013, but will fly more than a thousand times more - to 0.37 astronomical units, or 54.7 million miles.